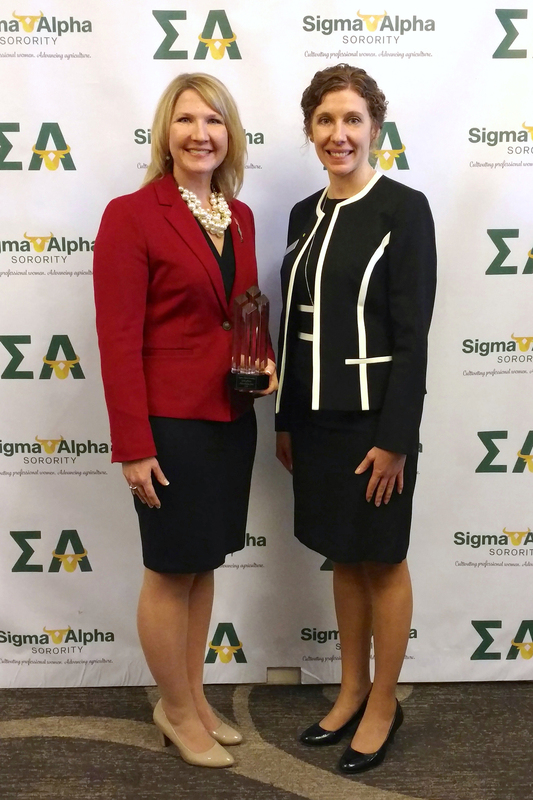 AMES, Iowa -- The director of alumni relations for the College of Agriculture and Life Sciences at Iowa State University received a national award Feb. 17 from Sigma Alpha, the professional agricultural sorority. The Sigma Alpha National Sorority Board presented Melea Reicks Licht with the 2018 Spirit of Ruth Award during the Alpha Gamma Rho and Sigma Alpha leadership seminar in Kansas City, Missouri. The national award recognizes Sigma Alpha alumnae for active involvement, leadership and commitment to the field of agriculture. Licht is one of four 2018 recipients selected for demonstrating Sigma Alpha’s four pillars of character: scholarship, leadership, fellowship and service. Bridget McFarland, a 2017 Iowa State University graduate and former president of the Iowa State’s Sigma Alpha Delta Chapter, nominated Licht for the award because of her enthusiasm and passion for the organization. Licht is an alumna of Iowa State’s Sigma Alpha Delta Chapter, which is the largest chapter in the nation with more than 100 members. She has served as co-adviser of the chapter since 2015. She also serves on the Delta alumni chapter’s executive board as active chapter liaison. Licht earned a bachelor’s degree in public service and administration in agriculture and a master’s in agricultural education and studies from Iowa State. Sigma Alpha national professional sorority was chartered in 1978 at Ohio State University. The Iowa State University Delta chapter was chartered in 1986. There are more than 56 chapters across the United States. Sigma Alpha’s objective is to promote its members in all facets of agriculture and to strengthen the bonds of friendship among them. It is the purpose of the members to strive for achievement in scholarship, leadership and service, and to further the development of excellence in women pursuing careers in agriculture. Melea Reicks Licht (left) is presented the 2018 Spirit of Ruth Award by Kim Stassen, vice president of Sigma Alpha National Sorority Board. Licht, the director of alumni relations for the College of Agriculture and Life Sciences, received the award on Feb. 17 during the Alpha Gamma Rho and Sigma Alpha leadership seminar in Kansas City, Missouri.